Description: NASA's two-seat F-16XL research aircraft streaks over the California desert near the Dryden Flight Research Center, during its final flight in the Supersonic Laminar Flow Control (SLFC) program. 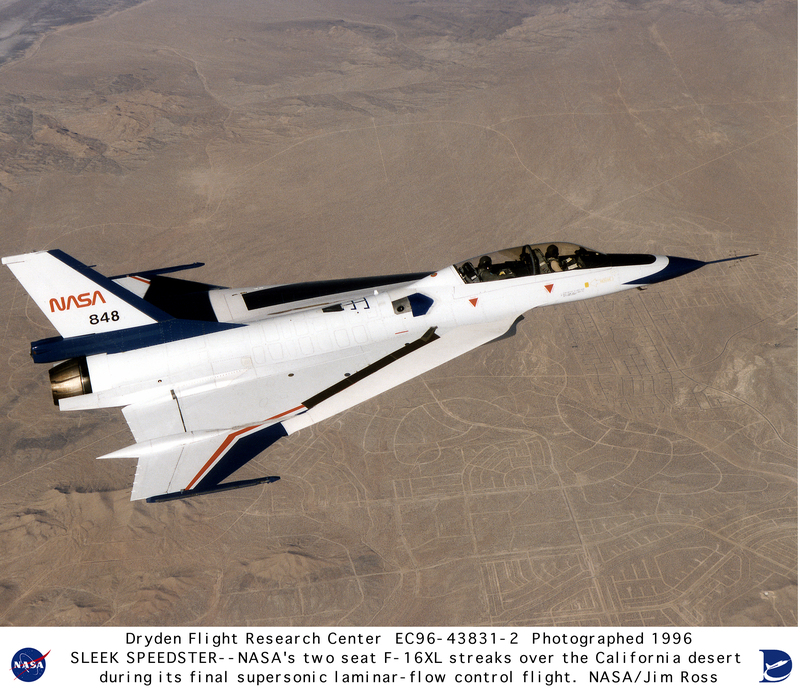 The unique aircraft with its "cranked-arrow" delta wing flew 45 research missions in the SLFC program over a 13-month period that ended in November of 1996. The project demonstrated that laminar -- or smooth -- airflow could be achieved over a major portion of a wing at supersonic speeds by use of a suction system. The system drew a small part of the boundary-layer air through millions of tiny laser-drilled holes on a titanium "glove" fitted to the upper left wing. About 90 hours of flight time were logged on the aircraft during the program, much of it at speeds of Mach 2 and altitudes up to 55,000 feet. Data acquired during the program will be used to develop a design code calibration database that could assist designers in reducing aerodynamic drag of a proposed second-generation supersonic transport.